DISPONIBIL IN STOC FURNIZOR - livrare in 5-7 ZILE! Designed by Pro Boat team driver Darin Jordan, Pro Boat’s Mystic Catamaran 29 BL PNP comes stock with an array of performance features providing enthusiasts with the ultimate in out of the box performance. Engineered from the ground up, the Mystic Catamaran is competition ready and includes a fiberglass hull, 1800kv brushless motor and 60 amp speed control. The esc and motor are water cooled and protected from the elements thanks to the sealed inner liner. The hull comes in white with a basic trim scheme applied and separate decals provided for personalization. Additionally, the unit comes with an offset rudder and stainless steel propeller providing precise control, an array of adjustment possibilities and higher speeds. The RTR version includes the popular Pro Boat 2.4GHz pistol grip transmitter and Spektrum MR200 receiver while the PNP version allows users to complete the model with the transmitter and receiver of their choice. 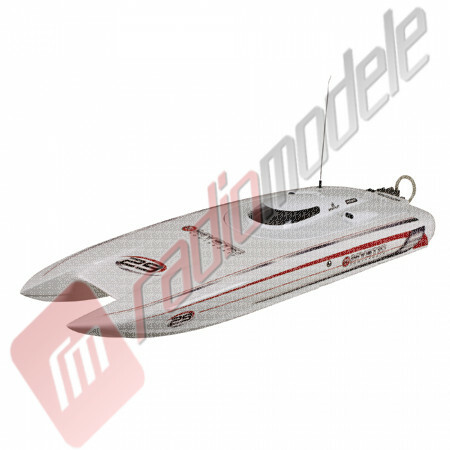 Navomodel de viteza Mystic 29 Catamaran BL PNP - Pro Boat.